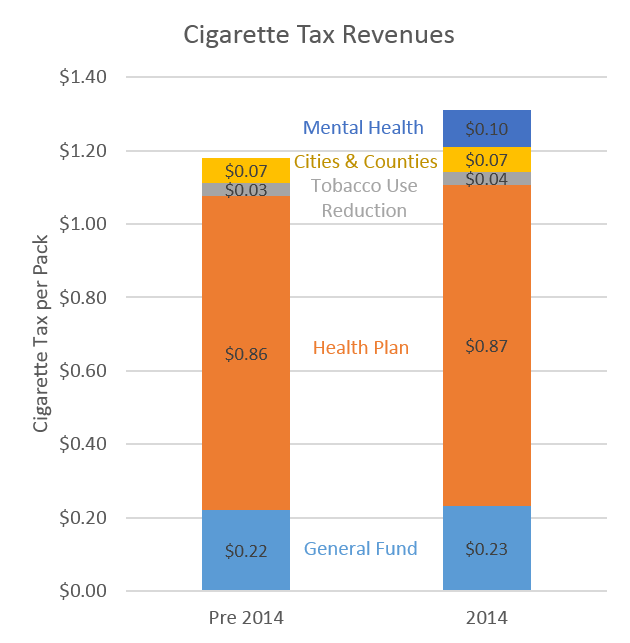 Continuing with our occasional series on the state revenue streams, today I’ll briefly discuss tobacco taxes and focus primarily on cigarettes. In terms of overall spending on tobacco and supplies, the consumer expenditure survey data shows a typical pattern across the country. That is, by and large, slowly declining spending (and revenues) but a big change following a tax increase. In 2009 the federal government raised the tax per pack of cigarettes from $0.39 to $1.01. 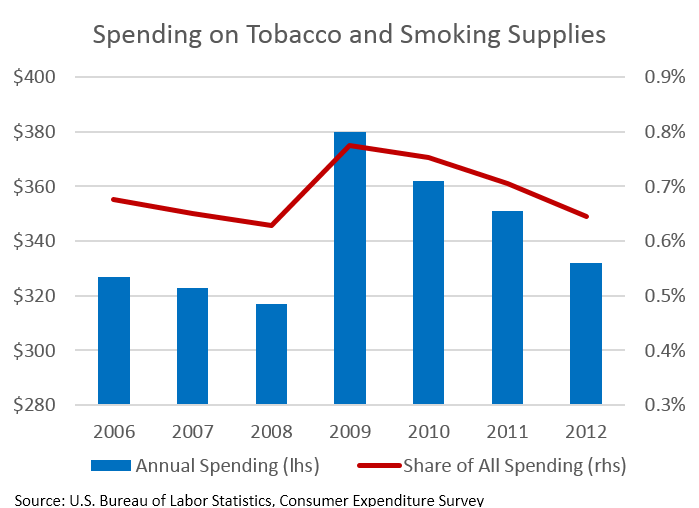 This was the driver in the increase in spending, not that suddenly more individuals started smoking in 2009. Locally, we are seeing the same sort of pattern. As discussed previous in comparing border tax issues with Oregon and Washington, tax policy differences between the states results in behavioral shifts. Both states have seen the downward trend in cigarette packs sold, however the movement around these trends is the interesting part. When Washington raises their tax (the red line goes up), sales in Washington decline more sharply while sales in Oregon level off or hold relatively steady. The opposite is true when Oregon raises taxes. This implies quite a bit of cross border activity in sales (primarily Washingtonians buying in Oregon). Our colleagues at the Washington Economic and Revenue Forecast Council find that roughly half of the change in sales following an Oregon tax increase is accounted for in cross border sales — that is about half of the decline in sales is due to less Oregonians purchasing and half due to less Washingtonians buying in Oregon. These tax law changes, and behavioral patterns, do result in revenue forecast errors, as discussed in more depth previously in The Lund Report. 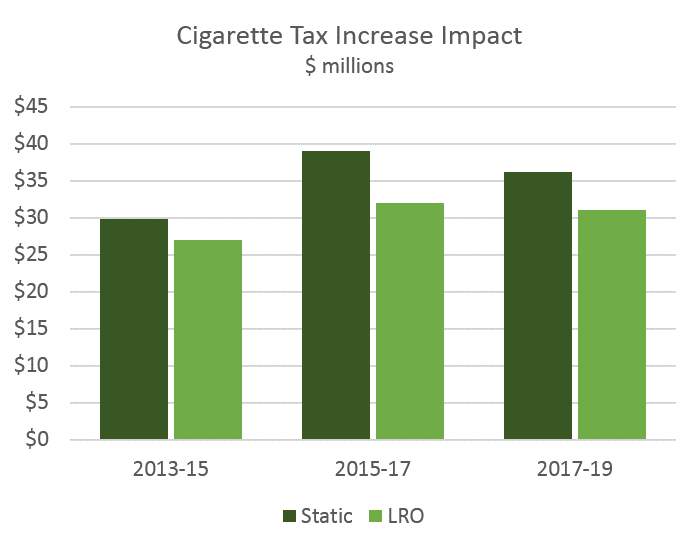 As part of the special legislative session near the end of 2013, one of the bills passed (HB 3601) raised the Oregon cigarette tax per pack from $1.18 to $1.31. To help put that increase in context, notice the decrease in the red line above. The tax differential between Oregon and Washington is still nearly as large as it has ever been, however there will be a behavioral response. To gauge this behavioral change in advance, I compared the static impact of the tax increase — that is, there will be no behavioral response — with that of the official revenue impact statement from the Legislative Revenue Office. As seen below, expectations are that the higher tax will bring in more revenue overall, just not quite as much as the static impact would suggest. The tax increase went into effect January 1, 2014 and as we get more sales data, our office will adjust this impact accordingly. Finally, the graph below highlights how cigarette taxes are distributed for use. For more details, including other tobacco tax revenue (cigars, snuff, etc) and the outlook please see Table B.6 in Appendix B of our quarterly forecast. Overall in terms of the outlook, our office’s expectations are for the slow decline in cigarettes sold to continue moving forward. 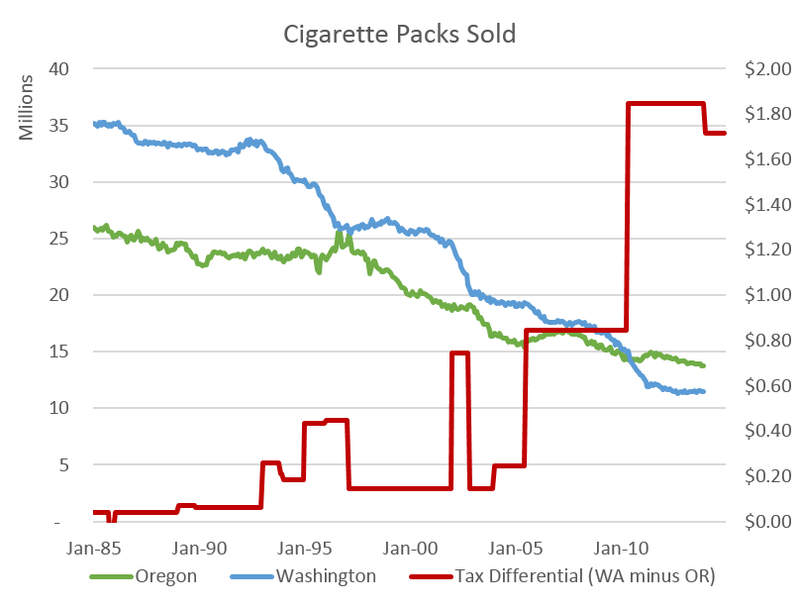 The recent increase in cigarette taxes will likely not decrease this trend too much, given the relatively small changes plus the differential with Washington remains large. However, as discussed previously when looking at spending patterns by age, retirement age households spend 48 percent less on tobacco and smoking supplies than due to those in their late 50s or early 60s. Like many revenue streams moving forward, the aging demographics will weigh on growth as the Baby Boomers move into their retirement years in the coming decade.